Moments when I played what game, where and with whom. Oh, the joy, I’m free! I’m free! It was 5pm, I just woke up from a nap. I heard the bell which my sister and I had been waiting for. “Ice cream!” I called the sorbetero. The flavors for today were mango and strawberry. Yummy! Many children were playing at the street. School days were indeed over! Some kids were playing badminton, some volleyball. Being the kid that I am, I joined them. For how many minutes, I don’t know, we played volleyball, batuhang bola, and badminton. It was fun. I was the oldest among them, of course, but I didn’t mind. Haha. I was already sweating and so bid goodbye to my playmates. After a little while, I felt like wanting to go outside again, and so I did. I was clearing out the leaves on our backyard when a VCS kid approached me. He was 9 when I taught him at Vacation Church School and now he is in Grade 7. We talked about his studies in highschool, and his plans for college. He then joined me in cleaning the backyard. Yey! Just as we thought the day was about to end, we found a long something (haha I don’t know what was it) which we used as a jumping rope. We jumped to the A is for Apple, B for Banana, C for the chocolate chant. 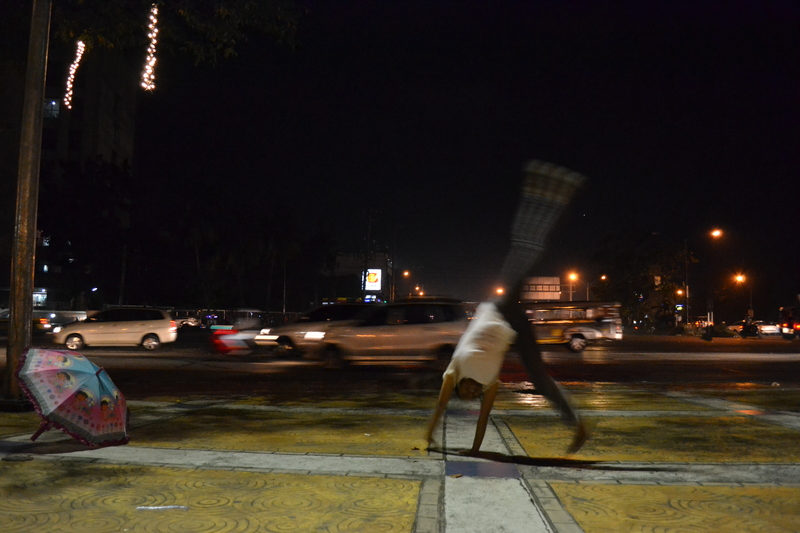 We bent our bodies as we walked under the limborack with the special rule in mind: No labas ngipin! Haha. We played volleyball again until it finally got dark. I bid them goodnight. Before I entered our gate, I saw a neighbor with his bike and borrowed it. I biked around the block and wished I could also own one someday. I entered our house, but something inside me called me to go outside again. I gave in and later found myself sitting with four little boys talking about the day. Hindi ka pa ba sanay… sa mga away-bati na yan? Ako sanay na ko sa ganyan. He said as he try to console his friend. Wow. I didn’t expect to hear that from a kid. Haha. Well, he is now in Grade 6 and is graduating tomorrow. Perhaps he had experienced a lot of petty and some serious quarrels with his playmates. Bakit siya nagboboss-boss-an e babae siya? Dapat ang boss, lalaki na mabait na gusto lahat magkakabati. As I sang and looked back on my afternoon, I felt like a child once again – a child in awe of almost everything. A child longing to play any game as long as the sun is up. A child wanting to belong, to have not just playmates for today, but friends till tomorrow. My playtime lasted for just two hours today but I’m looking forward to more hours of playtime for the coming days. I might not be able to spend the same kind of playtime when I get hired as a teacher, so yeah. More playtime soon! I saw my friends playing this game last Friday. The numbers took my interest and while watching a friend play, I was kind of wishing and waiting for the Game Over to appear on the screen. Hihi. Yeah, that was a not so good wish; I feel silly remembering I wished for it. At home, I checked the game online and played it for just an hour. And uhm, for another hour. I played for almost two hours. Or more. Yeah, I think for more than two hours. Oooh. I got hooked. No, this shouldn’t be! I had many last games until I finally played the last…for that night. The next morning, yeah, you’re right, I was in front of the laptop again, playing 2048. Pleasure came every time I scored higher and then there was the desire to score higher the next game. If I didn’t need to go, I would have played for hours. Thank God, I needed to go. I can’t stop playing by my own will and so I needed an external force to stop me. I stopped. I reached 1024. I travelled with my father. I could see the numbers and the grid. I tried to read a book to divert my thoughts. I was successful. When I closed my eyes, argh! The grid appeared again. I couldn’t rest. I texted my friends who introduced the game to me and shared my experience. I read the book again to divert my thoughts. A few minutes later, I fell asleep. That night, I managed not to play the game. Control yourself, Jas, I kept reminding myself. I felt fulfilled not turning the laptop on. Tonight, I saw the laptop and turned it on. You know what happened next. I just wanted to reach 2048 so that I could finally stop playing it again and again. And I also wanted to show it to my friends and feel proud of my achievement. After three (or four?) long games (yes, long, because each game took me almost 30 minutes), I finally reached 2048! It was a wow. I was surprised how it happened. I was happy! Now I could tell my friends I reached it. Right away, I posted it on my Facebook wall. It was a nice accomplishment. Right now, after reflecting on what this 2048 had done to me this weekend, I realized something. I love numbers. I love playing with numbers. I love being challenged to think. I love seeing patterns. I enjoyed the game, yes. I felt satisfied while playing, yeah, but as I notice how it was eating my time, I felt guilty. Playing 2048 for more than two hours a day made me feel, uhm, like it was, uhm, a guilty pleasure, or something like that. Yeah, for real. Even blogging about how I got hooked on it made me feel uneasy. I realized I had spent too much time for it. I won. Right. I’m glad I won the game now because that means I can stop on playing it again and again. Right. I should be happy. Oooooh. That’s it! Right! I won! Haha. I can free myself from this game now! Yes, I should really be happy! Haha. There, there. I’m thankful I have finished the game tonight because that means I can stop on playing it again and again! Now I could do more productive things again! Yes! Hello real life games -with less pressure and more fun! Hello animals and plants! Hello sky and wind! Hello fellow humans! Hello to God’s world where I can experience real satisfaction! And rest! Hello peace! The game is over. Yey! I want to say goodbye to you, 2048. Even to you, worldwideweb. I hope I could really do. Good bye for now virtual world! I need to experience more things in the real world. I guess, I’ll be here less often starting now. Hmm… Be online for just two hours a day starting today? Yeah, that would do.